Deanna (Melissa McCarthy) and Dan (Matt Walsh) have just dropped their daughter Maddie (Molly Gordon) off at college for her senior year. That is when Dan hits Deanna with the news that he wants a divorce. She had no idea there were any problems in their marriage, let alone that Dan was in love with a woman named Marcie (Julie Bowen). Reeling from the news, Deanna goes to her parents’ (Stephen Root and Jacki Weaver) house to figure out what to do with her life. Having completed most of her college degree, but never finishing thanks to Dan’s urging, Deanna decides to go back to school. Naturally, Deanna enrolls at Maddie’s college. And, with both of them in their last year, their paths cross frequently. Learning to reinvent herself, Deanna takes in the full college experience. She hangs out with Maddie’s sorority sisters, lives with an emo roommate (Heidi Gardner), is tormented by the college mean girl (Debby Ryan), and even hooks up with a hot college guy (Luke Benward). Deanna not only has to learn to deal with the ups and downs of college life, but also how to handle run-ins with Dan and his new girlfriend. 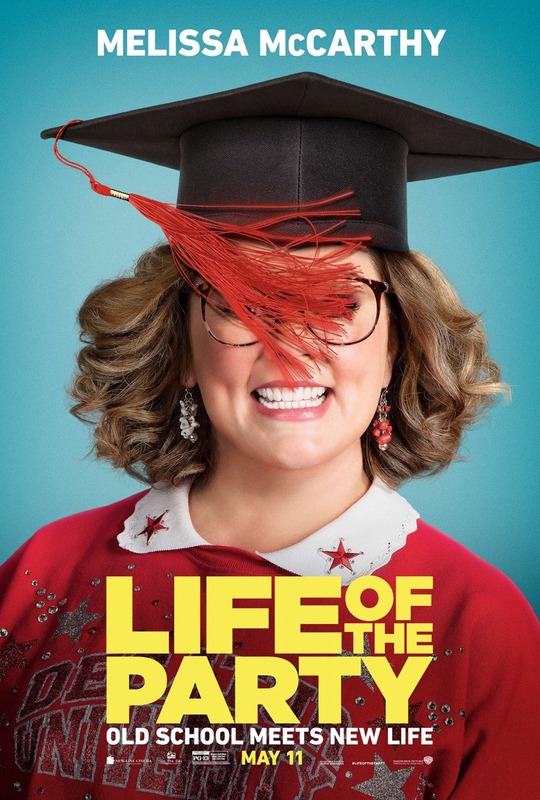 Life of the Party is the latest comedy written by Melissa McCarthy and her husband Dan Falcone, who unsurprisingly also directs and acts in the film. McCarthy has had her share of hits and misses when it comes to her films. It wasn’t until Spy that I really got on board with her style. Life of the Party, while maybe not peak McCarthy, lets her embrace what makes her so funny and run with it. She goes from doting mother and devoted wife to full-on college coed effortlessly. Her timing and delivery are pretty on point. Molly Gordon and her sorority sisters fill in the typical college roster, each having their own issues and looking up to Deanna as a mother figure. Deanna’s boyfriend Jack, played by Luke Benward, is as good a pairing as you can get pairing Deanna with someone young enough to be her son. Benward and McCarthy play off each other well. It is really Maya Rudolph and Damon Jones as Deanna’s best friend Christine and Damon Jones, Christine’s husband Frank, who steal the show. Their deadpan jokes and delivery take over every scene they’re in. Falcone and McCarthy have really found that sweet spot in their films. They have figured out how to take Melissa just to the edge without pushing her too over the top to the point where she gets off-putting. The jokes are fast and furious and the majority of them hit perfectly. They don’t rely simply on the physical comedy, using a smarter style that really works. If you’re still reeling from that other movie, or if you’re looking for a fun movie to take your mom to for Mother’s Day, Life of the Party is a good choice. It’s light-hearted and funny and offers and doesn’t go so far that you would be uncomfortable sitting next to mom while you’re watching it.